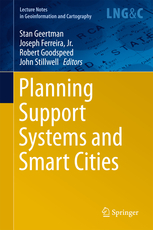 We have contributed a chapter to a newly released book ‘Planning Support Systems and Smart Cities’. As the global population continues to grow and an increasing number of people move to cities, there is need for ambitious approaches to provide urban information infrastructures and analytical tools to support smart urban design and planning. We outline the urban data and analytical capability the online workbench; introduce a couple of the PSS tools and spatial statistical capabilities through a case study approach. We also discuss the user outreach and capacity building capability program which is a critical component to assist with user adoption. We conclude the chapter with some reflections on the lessons learnt and next steps in the project.